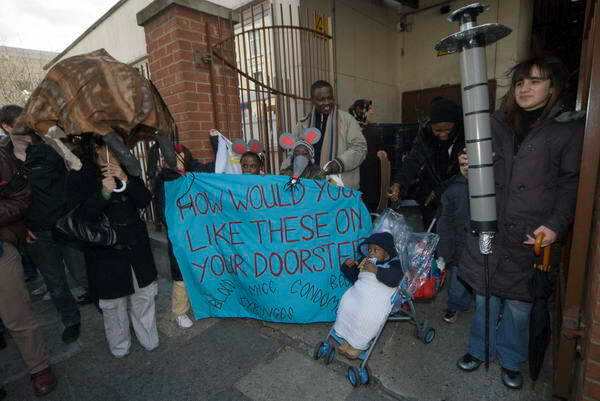 On Saturday morning, April 12, I arrived at a hostel in Stoke Newington from where residents, together with supporters of the London Coalition Against Poverty, were intending to march to Hackney council offices to highlight the appalling conditions they lived under and shame the council into taking action rather than simply making promises. As I arrived, another photographer, photographing for a local paper advised me I needed to talk to the organiser of the event. She told me that it might be a problem if pictures of some of the women involved were to appear in the press, as some had been rehoused after suffering violence from their partners and that photographs might reveal their location and expose them to further attacks. Since one of the issues the protest was about was the lack of security at the hostel, with no locks on the outside gate and easily broken doors to the flats themselves, this seemed a real problem. Of course, publicity was important to the case the residents was making. So they wanted publicity – and pictures. There was a dilemma here, and one which I don’t really think sensible that I should have been faced with. This was a protest in public, walking through busy streets in a major shopping area full of people with cameras – and I later saw many holding up their phones as the march past. If there are ever real concerns about people being recognised in public protests, the solution is obvious; they should cover their faces (and any other recognisable features.) Many people in demonstrations of course do, for various reasons and in various ways. In this particular event, masks depicting mice, rats and bed bugs would all have been appropriate, and added to the impact of the march, although simple scarves or balaclavas would have done the job. Photo call outside the hostel gate before the march. The umbrella is a bed bug. There were some ‘mice’ present, and they were difficult to keep out of the camera. I tried hard to make sure everyone in my pictures was happy to be photographed, because the last thing I want to do is to cause any problems to people who are already in difficult circumstances. Nobody I asked had any problems with having their picture taken, so perhaps all those whose position was sensitive stayed at home. This entry was posted on Monday, April 21st, 2008 at 10:20 am and is filed under My Own Work, Photo Issues. You can follow any responses to this entry through the RSS 2.0 feed. You can leave a response, or trackback from your own site.